My regular socks take more than half, but not all, of a 100 g ball of worsted-weight yarn. The leftover yarn is enough to do "something" with but I wasn't sure what. So, since I wanted short socks to wear in summer when bicycling, I decided to see just how far the leftover yarn from one sock would go toward making another sock. And with a bit of thinking, came up with a design I thought might work: a rolled top, then a short bit of ribbing (about 3/4 inch) then a short bit of stockinette before making the heel as usual. Not all the "regular" socks are exactly the same, since I've been refining their design bit by bit...so not all the leftover yarn is exactly the same length However, I now know that the leftover will make over half of a short stock. I finished all the "first yarn" on both socks--not quite the same length, but close enough. I've put them on, with my feet through the needles, and like the fit, so now to use up more leftover yarn and finish them. Wow. You have gotten exceptionally good at making those. Thanks. And using up the leftover yarn means that I will have more room in the stash boxes for...more yarn. I am imagining using black (which I don't have yet) to stripe the other colors against. Right now, the advantage of the short socks is mostly that I can do them faster and relieve the pressure on the oldest of the existing socks...since I liked them so much, they were rotated only long enough to dry after washing. Which, last summer, sometimes meant a pair was worn 3 times a week. 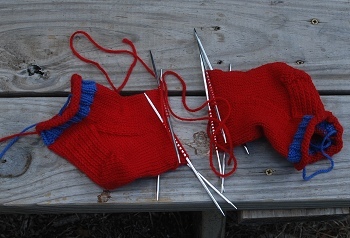 Each pair added allowed a longer rotation, but I can't just knit--there are books to write. And music to learn. And LifeStuff. Life is full of LifeStuff that sort of jumps out and clubs you as you saunter by thinking you know what your plans are. Anyway, the next pair is likely to be green with a purple-with-flecks stripe, or maybe two thinner stripes. Then the blue of the stripe on these socks with a red stripe. Unless I change my mind. I'm sure whatever you come up with for the coloring and design will look great. At least you have an idea of what you'd like. As I always tell my wife, I'll just "wing it". You could always use a variety of colors -- people will rarely see the toe part if you're using them for bicycling! By the way, how is the bicycling going? Pumped 'em up and I'm now at 5 1/5 miles for the day...but now it's raining, which we need, so that's a YAY! Those look great. Stripey socks are so much fun. Yes, I saw that. I found it interesting that when I wore my heart rate monitor to one of the big rehearsals for the Mozart C-minor Mass--and was thinking (because I came out dripping sweat and tired) that it would show my heart-rate increased...it didn't. Some of the comments on that article suggested that it's not true synchrony but a parallel response to the music--with some music lowering everybody's heart rate. I do know that breathing together happens, and since breathing patterns affect heart rate, that could be a factor. I've now worn these socks to ride the bike...they do great. First was a 3-ride day that totaled 10+ miles, and the second time was today, at 5.64 miles. Thanks to a software incompatibility problem, I can't upload the pictures right now, but I have them. Thank you, Rochelle. It means a lot to me (to any writer, actually) to know that a book has really touched someone. Add me to the choir singing the praises of your writing, particularly Remnant. I too cried and I too have kept it as a "comfort" book that soothes in stressful times. BTW, I used my leftover yarn to make multi-colored scarves. They take forever because I like to do blocks of different patterns as well as colors - each one unique. This isn't spam, and I am not a knitter, but I am one of your most enthusiastic fans. I love seeing a great imagination at work. Nice socks. Thanks! Glad you enjoy the non-fictional stuff as well. Good idea. I like these socks. Short, but not too short as to slip inside the shoe. Just a note to say I miss seeing you online - here, twitter, RMcK's comments. It's non of my business why, but hope you're well & happily engrossed elsewhere.